I've not had much puzzling time recently due to late finishes at work and on-call duties. Plus yesterday was the 32nd Midlands Puzzle Party (expect a report from Allard sometime soon). This will be a quick review of a single delightful puzzle. Back in November the incredibly talented (he has 9 pages of designs listed in the Twisty puzzle museum) designer, Grégoire Pfennig, announced that he had collaborated with the Chinese puzzle company YuXin to mass produce his design (which he had previously produced on Shapeways). I could not wait to get hold of a copy - my recent Wormhole 2 (and subsequent Wormhole 3) successes had left me more confident in my ability at puzzles within puzzles. I got my copy from my friend Martin (I'm sure it will eventually be available at PuzzleMaster soon). Just a couple of turns here and I am confused! My initial exploration did reveal a little horror! I had read the descriptions when it was announced and even watched the video of it but nothing can prepare you for the true realisation of watching a puzzle within a puzzle when it doesn't turn by face. 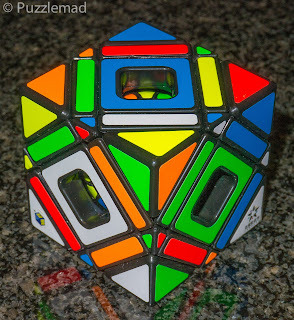 Yes, this one is not really a Multi-cube....it is really a Multi-skewb. 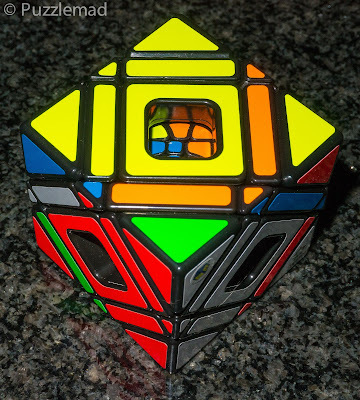 A deep cut corner turning cube with a 3x3 deep inside. 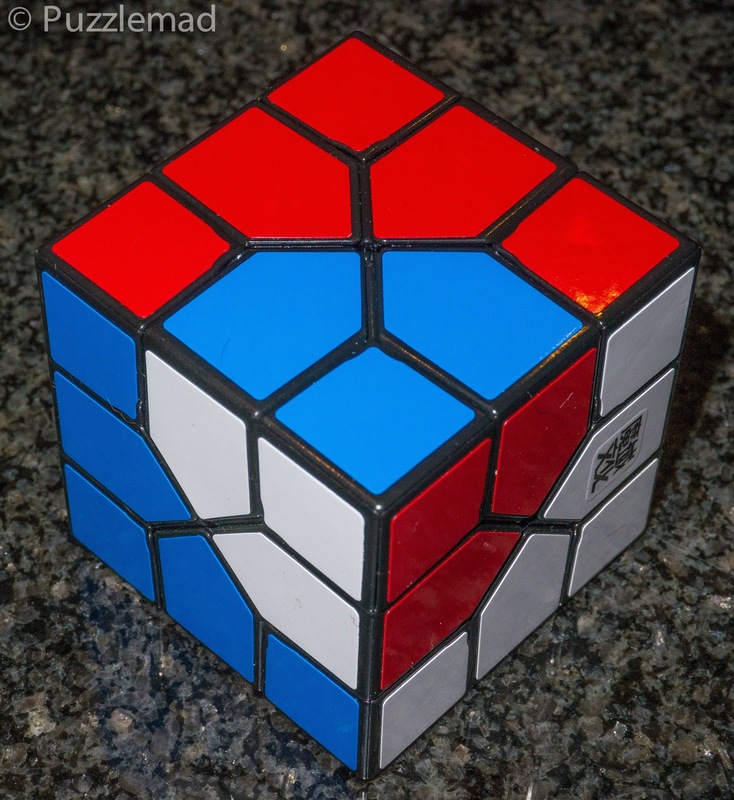 In fact, it is a Master Skewb (higher order than the basic Skewb). Dear Lord! What have I done! One thing that I had gleaned from TP and from Derek was that I needed to solve the interior 3x3 first and then try to solve the exterior later without messing up the interior. Yeah! Sounds awful! 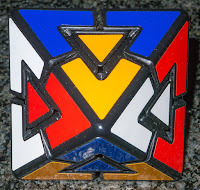 The first problem was how could I solve a 3x3 by turning the corners of an exterior puzzle? After a little nudge, I came to realise that the interior pieces were connected to different parts of the exterior and I just needed to shift my approach slightly! Easy? Actually not that tough once the connection is known. After just a couple of hours in front of the TV with the very generous Mrs S (she has given me permission to go to Ikea and purchase some more display cabinets for a spare room...I might get a whole 2m or more of wall space!) I had a lovely solved interior and the exterior was completely scrambled with even the windowed centres not aligned with the centres of the inner cube. Next, I needed to solve the exterior Master Skewb without buggering mucking up what I had already done. Now a peculiar feature of this puzzle is that it is possible to make a quadruple series of moves which consist of a pair of moves and undoing that pair and this changes the exterior without affecting the interior. I was extremely surprised to realise this and found that I can extend that 2 6 moves or more! As long as each of the moves is undone then the inner puzzle is unscathed. Time to think© and either work out how to solve a Master Skewb or, rather less likely, remember how to solve it. It took me another 2 evenings of varying success and I ended up working it out from scratch but I had all but the corners solved. At yesterday's MPP I did bring along some easier twisties to try and cajole/force the guys into thinking that they are not as impossible as they all think. I showed them the Redi cube (PuzzleMaster link) and the Pyraminx Diamond as examples of puzzles that relied on just simple 4 move algorithms like up, up, down, down or R, L, R, L. I am not sure that I convinced anyone to spread further into the twisty realm (in fact Shane thinks I am totally crackers!) but this is reminiscent of the Master Skewb solution - just a simple 4 move algorithm used in creative ways with simple set up moves and it's mostly done. Those pesky corners being out of position...also not a problem. With some puzzles, one just has to do the 4 move algorithm twice or thrice and BAM! We have a way to swap positions and then a setup move later we have them oriented correctly too. 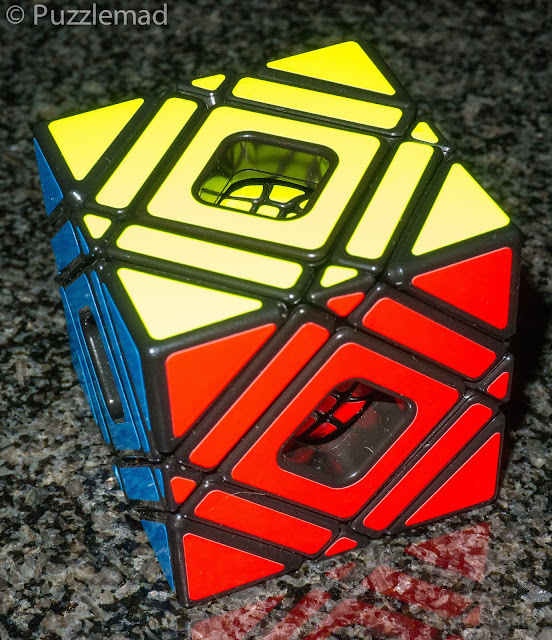 The Multi-cube looks horrific and when scrambling/scrambled looks even worse but it really isn't as bad as you might think. All just 4 move sequences with the odd setup move or doing that sequence several times. If you don't have one of these puzzles then you definitely should buy one - it is FAB! Hopefully I will have more to write about for you for next week. The puzzles I am working on just now seem to be rather complex and very time consuming! Addicted to your blog since a few months. Great work! 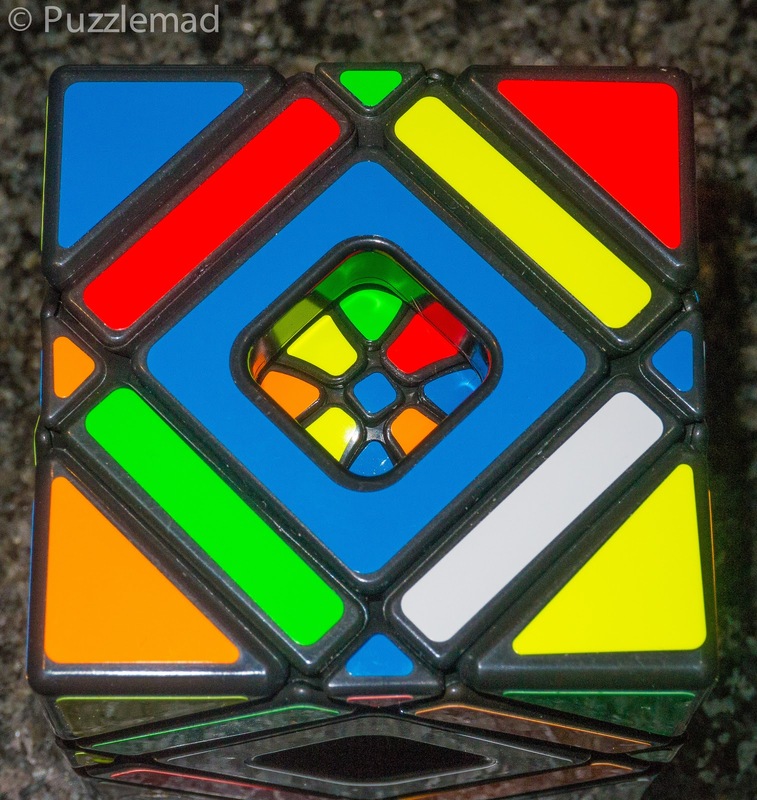 As a twisty puzzle fanatic (another grown man who should know better) I'm especially happy to see your recent twisty posts, incl. this one. 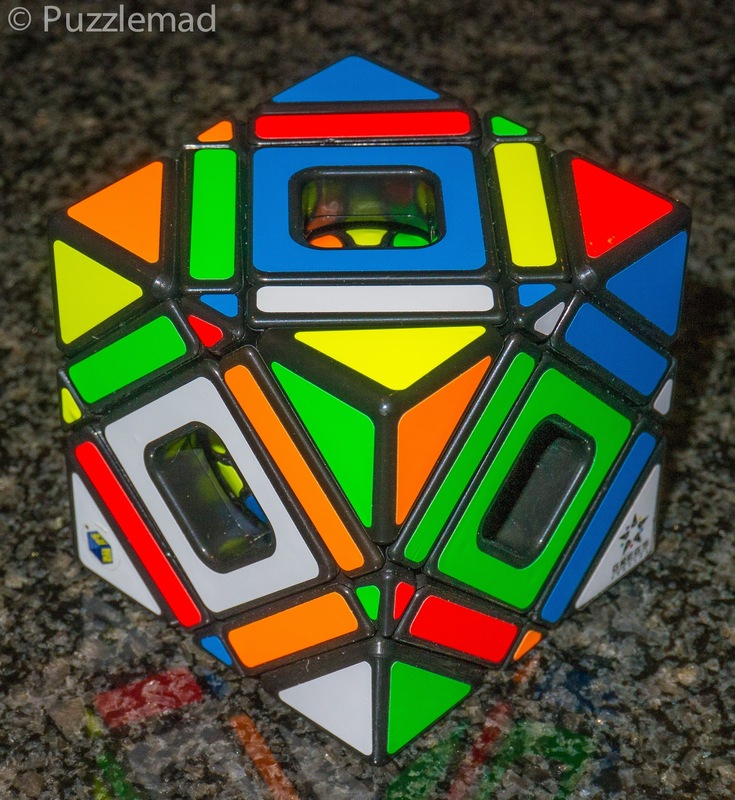 Maybe good to mention that this particular multi-cube/skewb puzzle may well be the highest quality complex twisty out there. It's turning is simply amazing. I’m glad you enjoy the blog! It’s a MASSIVE amount of work but I do love it. The general puzzler population tends to have only a small group who enjoy twisty puzzles which is a shame as they are a great challenge! Yes you are right...this puzzle is very high quality indeed with no catching or any tendency to pop pieces. This is a huge improvement on some of the much poorer quality puzzles released over the last year.